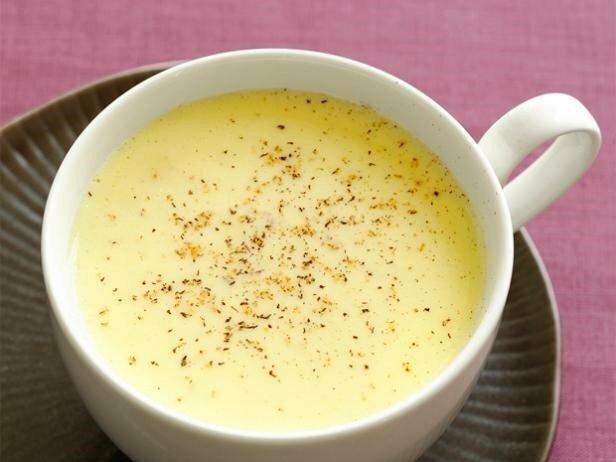 Combine 1 1/2 cups milk and the citrus zest in a medium saucepan. Split the vanilla bean lengthwise and scrape out the seeds; add the seeds and pod to the saucepan and bring to a simmer over medium heat. Meanwhile, whisk the eggs, egg yolk, sugar and cornstarch in a medium bowl until light yellow. Gradually pour the hot milk mixture into the egg mixture, whisking constantly, then pour back into the pan. Place over medium heat and stir constantly with a wooden spoon in a figure-eight motion until the eggnog begins to thicken, about 8 minutes. Remove from the heat and immediately stir in the remaining 1/2 cup milk to stop the cooking. Transfer the eggnog to a large bowl and place over a larger bowl of ice to cool, then chill until ready to serve. Remove the zest and vanilla pod. Garnish with nutmeg. *Note: I used 1% Organic Valley lactose free milk and 2 strips of orange zest.